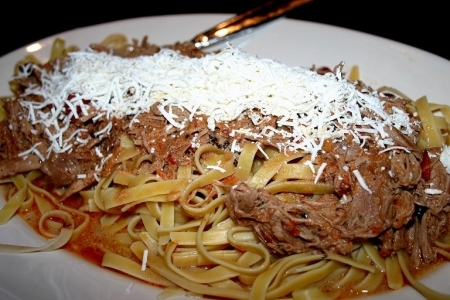 Bolognese sauces are generally a hearty type of sauce that is comfort food at its best. Most any type of hearty meat can be used, but duck was used for a touch of elegance. Duck is generally a meat that is not thought of as easy. However, think of it as a meat similar to chicken in that it can be kept in the freezer as you would a whole chicken, remove, thaw and cook in a slow cooker as you would a whole chicken. Which is exactly how the duck was cooked for the Bolognese sauce. Fresh basil was used, but it could be replaced with a different herb or herbs, such as, fresh oregano, thyme or rosemary. Or use a mix of herbs. Ingredient amounts will serve 6 – 8. Thaw duck, remove anything inside the duck, rinse and place duck into a large slow cooker breast side down. Add salt, pepper, garlic, wine, diced tomatoes and basil. Cover and cook for 4 hours on high until meat easily falls off the bone. Remove the duck and place into a large dish too cool. Do not discard juices in the slow cooker, because it is going to be your broth to finish the entrée. With a large slotted spoon, try removing all diced tomatoes from the broth that is in the slow cooker and place into a magic bullet or a blender. Blend diced tomatoes with a ladle of broth from the slow cooker until smooth and set aside. Once duck has cooled enough to touch remove all meat, shred and return all meat back into the slow cooker. Make sure no bones or fat remain in slow cooker, and that you have removed the bones and fat from the duck. Reduce heat to low, cover and cook for one more hour. After an hour has passed turn slow cooker off. Place a large strainer of over a large deep bowl or pot and dump or scoop contents of slow cooker into the strainer. This is to strain the broth from the duck to create the sauce. Measure out 3 cups of broth and 4 cups of duck. Refrigerate any extra duck or broth for another purpose. In a large deep skillet, heat olive oil over medium high heat. Add the blended tomato mixture, 1 cup of broth and reduce by half. Repeat process until all 3 cups have been added and sauce is starting to thicken. Lower heat, add half and half, stir and simmer over low heat. Cook sauce longer if you want a thicker sauce, less for a thinner sauce. Add the duck and cook until warm about 5 – 10 minutes. While sauce is simmering cook pasta per package directions. Drain pasta and add to sauce pot and toss well. Serve family style as shown or individually plated with fresh grated ricotta salata or parmesan cheese. Try Masi Campofiorin (Italy), Fuedo D’elimi Nero Davola Sicilia Indicazione (Italy) or Masi Modello Delle Venezie (Italy).